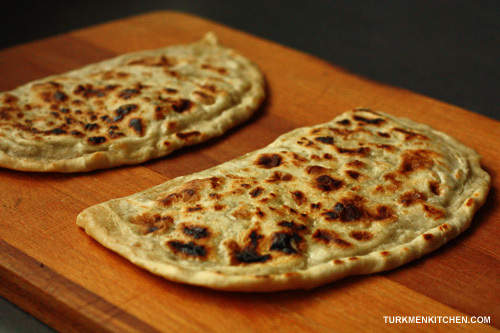 Gyzzyrma gutap is the Turkmen name for stuffed “half-moon” flatbreads that are cooked in a pan over the stove. Gutap can also be baked in the oven (in this case, make the dough thicker) or deep-fried in oil. Mix all the filling ingredients together in a large bowl. Set aside. In another large bowl, mix all the dough ingredients together and work to a soft dough. Divide the dough into 10 equal pieces and roll each piece between your palms into a ball. Cover the dough balls with a kitchen towel and allow to rest for 5 minutes. Place a pan over medium heat. Working with one ball of dough at a time, sprinkle some flour on the dough and roll it out to a circle of about 20 cm in diameter. Spread about 3 tablespoons of the filling over half of the circle, leaving a thin border. Fold the other half over to form a half-moon shape and press down along the edge to seal. Prick all over the top with a fork. Place the gutap in the hot pan and cook, flipping once, until browned in spots on both sides. While one gutap is cooking, prepare the next one. Serve straight off the pan. looks very delicious . . .
Great site, but not too many recipes. Keep posting please, my husband begs me to cook somsa as his Mom does and I just don’t know how to do the perfect dough! Can you please post the recipe for SOMSA? I will really appreciate it! And again, keep posting Turkmen recipes! Thank you! Thanks Alina. More recipes, including one for Somsa, will be up soon! Could you please post recipes for Chuberek, Ishlekli, Gatlakli and Fitchi. Thank you! Recipe for Ichlekli is here. And I’ll try to post the others soon. I’m so happy to found this website !!! This is my country food!!! Thank you!!! Thank you for this great idea!! I’m so happy to found this website !!! This is my country food!! !